Blog What about the POOP? What is the number one concern when it comes to laundering diapers at home? “But, what about the poop?” It’s a question I hear often and the answers are easy! So lets set the record straight! POOP Happens. In ALL DAIPERS. So no matter what you use, disposables or cloth – you have to deal with it. Here is the thing – It is less smelly and easier to clean up with cloth. Sometimes a LOT easier than with disposables. I know I know you are thinking I am crazy (unless you already have experienced this)! In disposable diapers you get the dreaded blow outs. You know, where poop shoots up the baby’s back almost to their neck. It means a full out bath for everyone. This doesn’t happen with cloth and that means much easier clean ups! Take a read and find out how. Exclusively Breastfed baby poop. This is the easiest type of poop. It just goes straight in the washing machine. Now, you may be thinking. WAIT WHAT DID SHE JUST SAY? Yes, you read that correctly. Put the whole diaper poop and all in the washing machine. I promise it will come out clean. Breastfed poop is water soluble. It just washes away like it never happened! I was paranoid about this with my first baby. I used a diaper sprayer on all of the diapers (silly me). Second baby – I just don’t have time to spray 6 diapers a day so into the wash they went and guess what? They came out just as clean as they did when I sprayed them off with my first child. “Solid” formula poop or food poop. This comes in at types but normally starts as a sticky “peanut buttery” mess. So…what do you do with it. Well. You have a few options. The good ol’ dunk and swish. I find this largely ineffective, gross and frustrating. Not for me. Scrape it off. Also – not my top pick. Messy, requires a “scraping spoon” which you then have to wash and still leaves a residue. Flushable Liners. Simple. These are perfect for on the go and places like daycare. Some people use them exclusively and love them, I just happen to be a sprayer gal. How do they work? Simple. Place the paper thin disposable liner over the diaper. 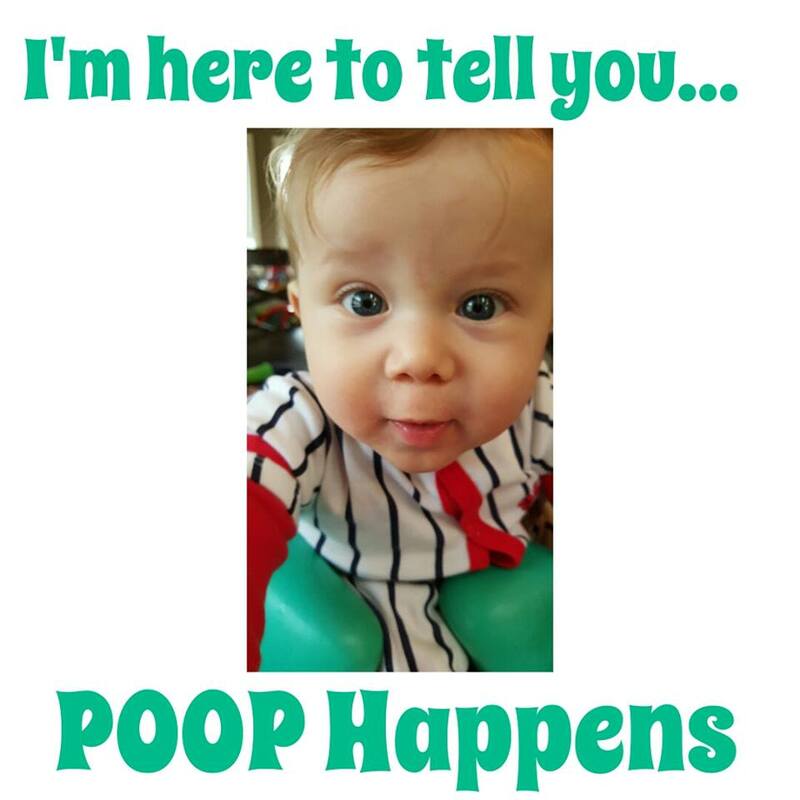 When baby poops, grab the corners of said liner or dump the liner into the potty. Flush. Poop be gone. What’s the catch? These do not work well in low flush toilets. You know the ones that use less water to be good for the environment. If you have those you may want to dump into the garbage or use a sprayer. I have the low flush style of diaper so, I only use these for out and about and daycare (daycare sends the diapers home for me to deal with – so I don’t have poop dried onto diapers if I use these!). Check out the GroVia Bioliners here. The Diaper Sprayer. My Favorite! The Diaper Sprayer is this amazing little piece of hardware that attaches to your toilet. Then, you simply spray the mess into the potty and flush. Voila. Also comes in handy for extremely messy clothing (think stomach flu) and rinsing out the potty during toilet training. I like to pair with the Diaper Dawgs Spray Collar to prevent any splatter. They make the perfect pair! The only downside is there is a bit of an upfront cost. But to me – this accessory is worth it’s weight in gold! When selecting a sprayer check for one with a backflow valve and an shut off! These are very important features to prevent floods and little curious toddlers from having water fights in the bathroom! Take a peek at the AMP Sprayer/Diaper Dawg Combo option here. Dealing with the Poop is SIMPLE. POOP Happens, but it doesn’t have to be a mess!